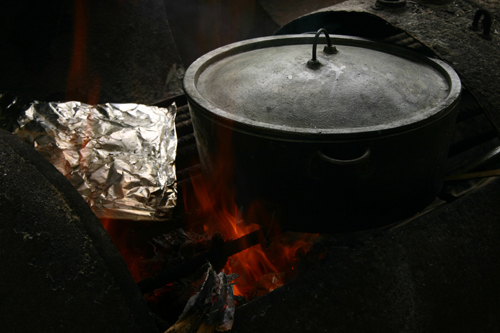 The Boil Up is considered to be the cultural dish of the Belizean Creoles. It is combination of boiled eggs with either fish or pigs tail, with a number of ground foods thrown into the pot such as cassava, plantain and sweet potatoes, and served in a rich tomato sauce. Cassava cakes are made from ground cassava – the cakes are lightly fried, then dipped in coconut milk and fried again. Fish seré is made with coconut milk, mashed plantain, tomatoes, potatoes and onions, served with tortillas. Among the other main staples of a Creole dinner are rice and beans with some type of stewed meat, potato salad or coleslaw. Traditional Garifuna foods are based around fish, chicken, cassava, bananas, and plantains. A major staple of the diet is cassava. Cassava is extremely versatile and is made into bread, drinks, puddings and even wine! Cassava bread is served with most meals. Hudutu is a very common meal, consisting of fish cooked in a coconut broth (a close cousin to seré in Creole cuisine) and served with mashed plantains or yams. Dharasa is the Garifuna version of a tamale made with green bananas. It can be made either sweet or sour. Belize is really ‘upping the ante’ on the international fine dining scene with the increasing prevalence of luxury resorts and accommodation. Our favourites include Rojo Lounge, a hip and exclusive loungey spot that has won Fodor’s choice five years running. The key lime pie martini is a must! Rendezvous Restaurant is the only Thai / fusion restaurant on the island, let Colleen knock you up a ‘chef’s table’, her whimsical creations of the day. In town, Wild Mangoes serves ‘nuevo latino’ cuisine, Caribbean food infused with spicy latin influences from Cuba, Mexico and Argentina. On the mainland, Ka’ana boutique resort has also been winning awards. Their acclaimed La Ceiba restaurant serves dishes that represent the different regions in Belize, with a modern and creative twist. Laid back yet stylish Rumfish Y Vino in Placencia serves fabulous house made smoked fish dips, pâtés and much more to accompany their legendary ginger mojitos.